Artist's impression of one of the proposed open spaces forming part of the Townsquare development. 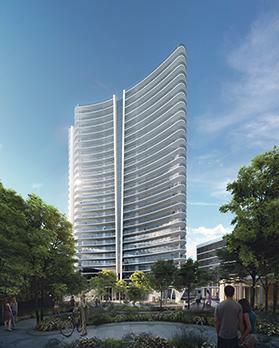 Tigné residents’ fears over the impact of the Townsquare high-rise project have increased despite new downscaled plans, a social impact assessment has found. 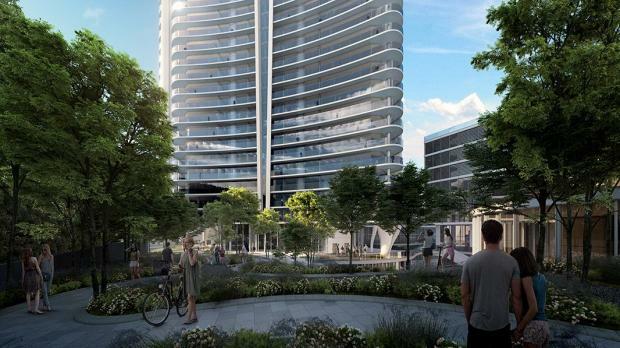 The Townsquare plans have been reduced from 38 storeys to 27, among other changes intended to minimise its impact, after a controversial permit issued two years ago was revoked following an appeal by objectors. However, a sociological study published as part of the environment impact assessment on the new plans shows public perception to the project remains “generally negative” since it is viewed as being a sizable development within an already developed area. Residents said there was no need for another high-rise development in the area and expressed fears that the project would pave the way for similarly high developments in the immediate surroundings. According to the report, the fears became more pronounced since the last similar study in 2007 as residents are more mindful of the impacts such a project could have on their surroundings. “It is evident that previous concerns over physical and social overshadowing and reduced light penetration have become serious concerns that they will be dwarfed by surrounding high rises in the future,” the report notes. Residents also expressed fears that the project would further commercialise the immediate surroundings, still considered primarily residential, and that it would exponentially increase the population, reducing any remaining sense of community and locality left in Tigné. Younger respondents – those aged 16 to 25 – were more positive about the project, though the report adds that this varied depending on whether they had elderly family members living at Tigné. Residents were also positive about the increase in open spaces included in the project as well as the impact of commercial outlets on the local economy and the possibility of the project leading to an upgrading of the area’s overall infrastructure, which they said should take place during the planning stage. Recently-arrived foreign residents in particular felt that if the project offered the right services for everybody, it could improve the quality of life and sense of community in the area. The EIA also considered the visual impact of the project from several viewpoints, concluding that the largest impacts would be on close viewpoints in Sliema, Gżira and Valletta as well as Villa Bighi, in Kalkara. Minor or moderate impacts are predicted from Mdina, SmartCity and Vittoriosa, while the tower will not be visible from viewpoints at Marsa, the University campus or Fort St Angelo. According to the report, traffic is expected to increase by about 21 per cent over current levels, with an average of 2,569 additional car trips along Qui-si-Sana on weekdays, down from 3,500 in the earlier plans. However, an air quality study concluded that traffic emissions will potentially be negligible. Air quality is expected to be a more significant factor during excavation, though the report notes that most has already been completed, with the remaining works only expected to last four months. The new plans are also expected to reduce overshadowing on nearby properties, with most shadows falling on the site itself, as well as increasing the provision of open space.